Click Here to Listen to Canon Performing "I Don't Care"
Some of our stomping grounds were: Old City Jail (Tacoma), Latitude 47 (Seattle), The Phoenix Club (Yakima) and Saratoga Trunk (Bellevue). More about Emi: Married to Micky, guitarist for Motley Crue, one of the Nasty Habit girls from the same album and video. Sarge’s favorite weekend with Canon: We were booked for two weeks at the Red Caboose in Vancouver, Washington. On our one day off, all the guys piled into Marv's little BMW and drove to Yakima, where we played often, to visit our respective "friends". I met drummer Marc Nelson in the summer of 1979 at a recording session. We played very well together and loved the same progressive music from the 70's. 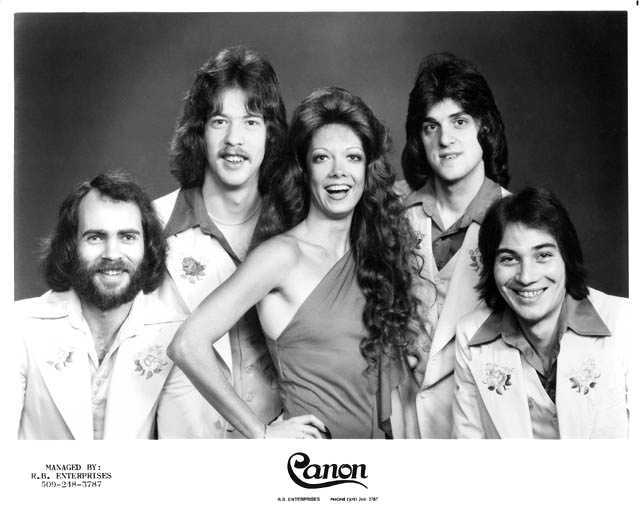 Marc was dating Emi Canyn and by late 1979 they asked me to join their new and last version of Canon. We recruted Mark Robertson on keyboards and Scott Lindenmuth on guitar. The band needed to travel in order to survive but Scott was already a guitar teacher so he left the group.. We auditioned powerhouse Vladimir Ringo. He got the job and we landed ourselves a fresh canvas with great players with huge ears. It seemed that the only people that really liked us were musicians and our moms. We played songs by Yes , Dixie Dreggs, Blondie, Hendrix, ELP and a couple of sweet originals. We performed at Gatsby's in Bellevue, Eddie's Hayloft in Anchorage, and venues in Portland, OR and Seattle, WA. Canon 1980, the possibilities were enormous, so were the egos. I started this band in August 1976 because I heard Emi sing at one my rehearsals while playing bass with Hot N’ Nasty, the band I was in at the time. When HNN ended I formed the band around Emi, with my HNN drummer Ron Parry, his friend Pat Drew (guitar) and I don’t remember how we found John Harrigan (keyboards). Emi could sing anything and we could play anything from Heart to Barbra Streisand. It was fun creating an orchestration to fit a four piece band. Steve (Sarge) Stransky and John Lucas were later additions and by that time disco was in and we were sick of it. We didn’t call Steve “Sarge” and it was “The Main Street Station” in Vancouver, not the Red Caboose however he was correct with regards to the Yakima weekend. The original band (sans Pat Drew replaced by John Lucas and Steve) folded after that and so we played our last gig together at the “Old City Jail” in Tacoma, WA in the fall of 1978. Marv, Ron, Amy Jo, Steve, John H., John L.